19 PREMIUM BOTANICAL INGREDIENTS – This Gift Set is a Selection of The Finest Botanical Spice Ingredients From Around The World. Designed To Bring Life To An Ordinary Gin And Tonic, This Gift Set Is Easy To Use And Has A Certain WOW Factor. THE PERFECT GIN GIFT – Stuck on What Present To Get That Gin Lover? This Selection of Gin Inspired Spice Ingredients Will Surely Win Them Over! 19 Botanicals Include: Orange Peel, Lemon Peel, Juniper Berries, Allspice, Rose Petals, Fennel Seeds, Cardamom, Coriander, Pink Peppercorn, Lemon Grass, Cassia, Elderberries, Lavender, Lime & Chilli, Liquorice, Cubebs, Ginger, Apple, Strawberry. LIVEN UP YOUR GIN AND TONIC – Simply Add As Many Or As Few Botanicals To Your Drink, They Will Enhance Your G&T Like You Have Never Before Experienced. Dual Purpose – Garnish A Gin and Tonic Or Infuse A Bottle Of Gin! A Delightful Selection Of Botanical Ingredients From Around the World. Designed to be easy to use and fun! This extravagant set of botanicals can transform any gin & Tonic into an amazing botanical cocktail. What’s even better, the botanicals will arrive with at least 10 months shelf life, so plenty of time to enjoy them. These Ingredients Will Enhance And Add Complexity And Flavour To Any Gin. The Best Part Is You Can Mix And Match The Ingredients To Find Your Favourite Combination! Orange Peel, Lemon Peel, Juniper Berries, Allspice, Rose Petals, Fennel Seeds, Cardamom, Coriander, Pink Peppercorn, Lemon Grass, Cassia, Elderberries, Lavender, Lime & Chilli, Liquorice, Cubebs, Ginger, Apple, Strawberry. 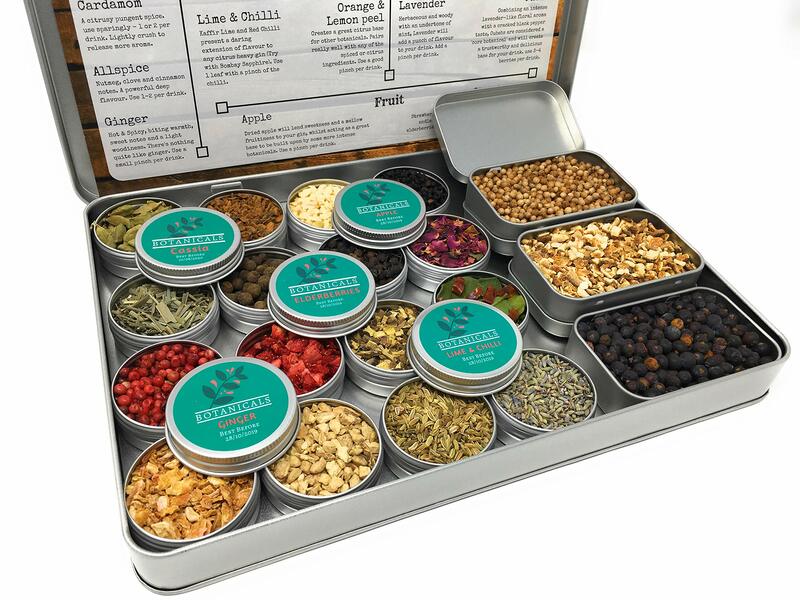 Each Botanical Is Encased In Its Own Screw Lid Tin To Maintain Freshness, Full Instructions Are Also Provided as well as a Description of Each Botanical. How To Use: Simply Select Which Botanicals You Wish To Infuse Your Gin and Tonic With, Then Sprinkle The Recommended Portion Size Into Your Drink Or Bottle Of Gin. This Luxury Gin Box Set Makes A Fantastic Talking Point At Cocktail Parties As Well As A Brilliant Accompaniment To A Bottle Of Gin. EASY TO USE – Navigating Through The Ensemble Of Ingredients Couldn’t Be Easier, You Don’t Have To Be A Mixologist To Have Fun With Botanicals! We Include Full Instructions As Well As Hints And Portion Measurements. BEAUTIFUL PRESENTATION TIN & LONG SHELF LIFE – Set In a Simple Yet Stylish A4 Size Tin, This Elegant Gift Set Comes With Full Instructions And Details On Each Botanical Ingredient. Your Botanicals Will Arrive With At Least 10 Months Shelf Life – Giving You Plenty Of Time To Enjoy Them!